28th May 2012 Added the February Meeting Report. Tuesday, 3rd January, 2012 at 7.30pm. 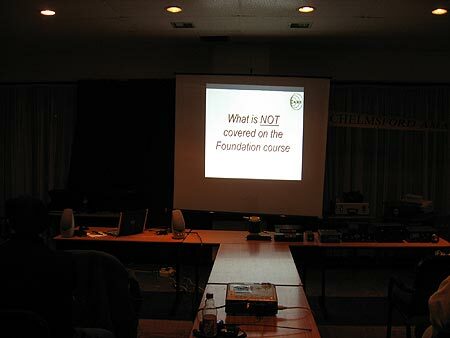 "What is NOT covered on the Foundation Courses". Despite the high winds and rain that Essex endured it was good to see so many CARS members had braved the elements to attend the first club night of the year. 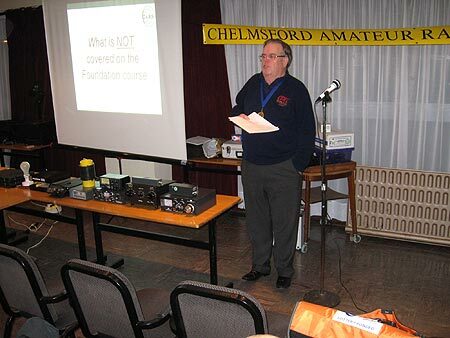 Following on from opening announcements from John Bowen G8DET, and CARS President Carl, G3PEM who is organising the 80 Metre Activity Event, Mark Sanderson M0IEO kicked off “What is NOT covered on the Foundation Course”. This is a series of talks and practical sessions designed to be of help to newer amateurs still learning the ropes, as well as for more seasoned operators looking to expand into other areas of the hobby. Invitations had been sent to the CARS database of M3 and M6 Foundation Course graduates, and it was good to see so many new faces. 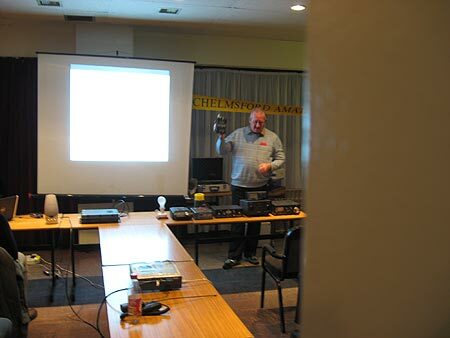 Carl explaining the January 80M Activity and Introducing the evening. Part of the audience and Brian, G3CVI sitting by his "Tuned Earth" table. Peter Sipple is on the right. The first talk, “Foundation to Full”, was from Pete Sipple, M0PSX, who gave the audience a brief overview of his 14 month journey starting as a newcomer to hobby in late 2010, as he progressed through the three licence stages with the help of the CARS Training Team. Peter then discussed a number of modes that he has been using, starting off with a demonstration of the PSK31 data mode, and the weak signal propagation reporting software WSPR. Mark talking about Aerial Tuners and Peter showing a Waterfall Display. 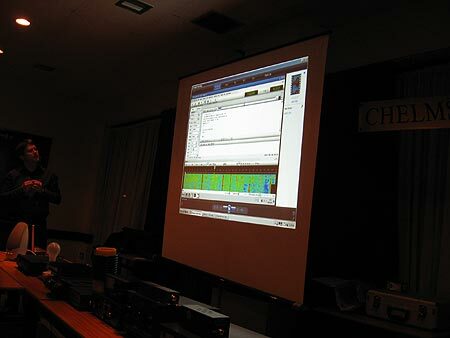 This was followed by a summary of Pete ‘s experiences of receiving audio, text and images from the ARISSat-1 amateur radio satellite, complete with an audio recording and SSTV images received from space, plus a QSL Card confirming reception of the satellite’s signals. Sadly, since the club night, ARISSat-1 has now re-entered the atmosphere, and can be heard no more. Pete finished with a brief demonstration of the FUNcube Dongle Software Defined Radio, which offers access to the spectrum from 50MHz to 1.7GHz for around £125. Mark M0IEO then gave an overview of some of the essential tools of our trade, notably dummy loads (including the use an incandescent 40 watt lightbulb), low-pass filters, and ATUs. As well as explaining the "dos and don’ts" of how to set up a station correctly, Mark explained the benefits of correct filtering, and some common ‘gotchas’, such as ensuring that you remember to modulate when tuning your antenna on SSB. 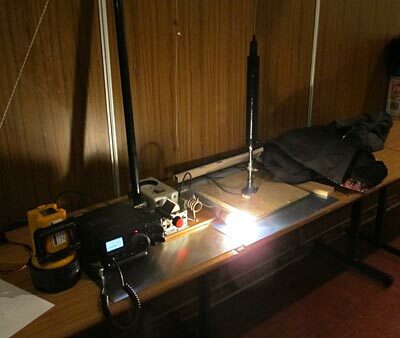 Following the break, attendees were able to watch and take part in various demonstrations, including Brian G3CVI’s demonstration of how your station’s earth can radiate, tuning a magnetic mount antenna with an MFJ29, an impressive ‘lightsabre’ demonstration using RF and a fluorescent tube by Peter G3SUY, and Carl G3PEM explaining to how to build a dummy load. John, G8DET testing a Magnetic Mount Aerial with a MFJ259 and Peter G3SUY lighting a Floucesent Tube with RF from a home made mobile whip antenna. 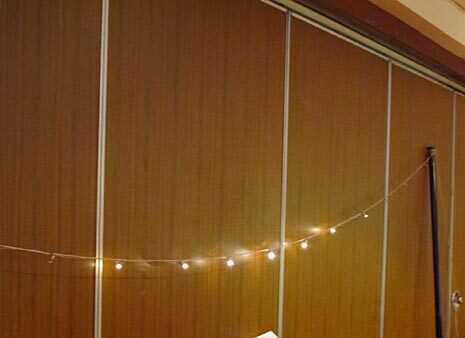 Peter, G3SUY demonstrating Torch Bulbs lit showing current distribution in a Half Wave wire Aerial and using a 60 Watt Incandescent lamp as a Dummy Load. 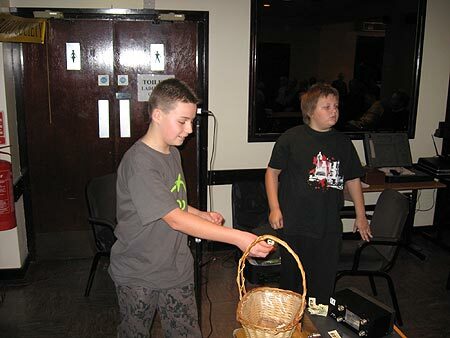 Brian explaining the Tuned Earth device and Luke, M6LNT drawing the Raffle. 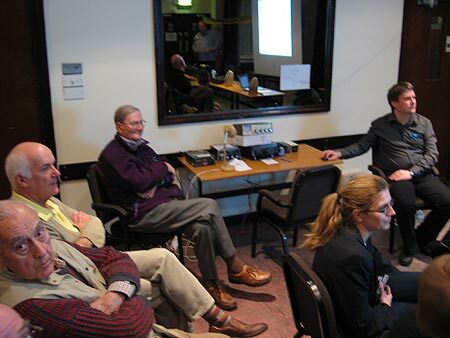 Photo left, Peter, M0PSX playing the interview by Essex Radio with Clive, G1EUC - Photo right, Peter G0KSJ (seated left) who runs the Raffle and CARS Member George G0LKY. Report by Peter Sipple, M0PSX. Tuesday, 7th February, 2012 at 7.30pm. " 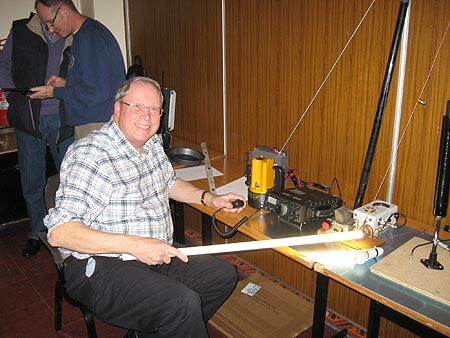 CANCELLED - Amateur Radio Self Build Kits". Very sorry but with discussion we have decided to CANCEL the Tuesday, 7th February Meeting at MASC. 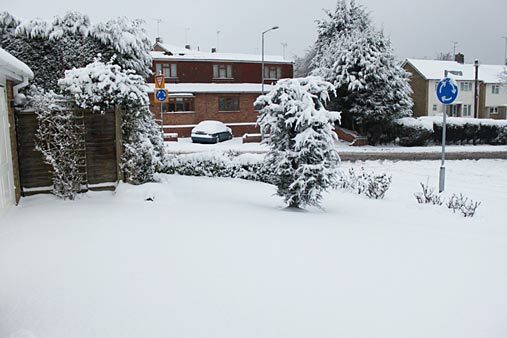 Although the M25 and the A12 are now running very few Members actually live on them and since Essex County Council now have a “We do not grit Side-Roads” Policy many people will be snowed in today and Monday and Iced in on Tuesday. We also know that MASC do not “Snow Clear” the car park so that will be like a skating rink for a few more days. G8DET has 8” of snow and a White Van has parked (abandoned) in the critical part of the hill up my road so even a Snow Cat could not get up now! Just before that a Monster Truck pulled an Audi A6 up the hill using his crawler gear. 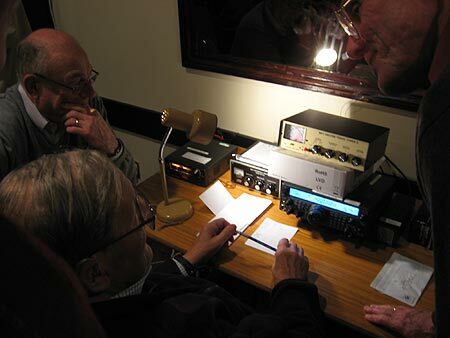 We had a “supplementary 2Metre, GB3DA Net starting at 8.30pm” on this Tuesday with Geoff, G3EDM as the Net Controller. About 12 Members called in - some for one "Over" only due to cold in the shack, illness or to watch TV. 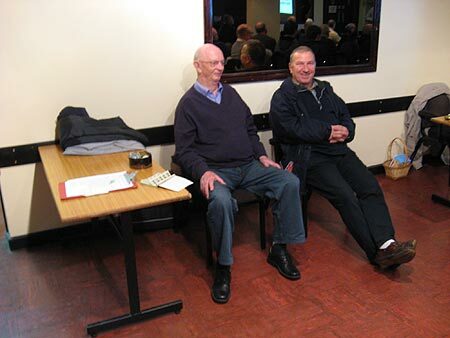 Geoff called for a Minutes Silence in respect to Keith, G7WCM who died on Monday. Many different topics were discussed but the main one - Cancelling the February Meeting was unanimous - local roads were far too dangerous to use at night with a temperature of minus 6 degrees C at 21.30hrs. 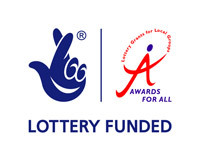 If you have any pictures for circulation or the Web Site – please send them in to me. 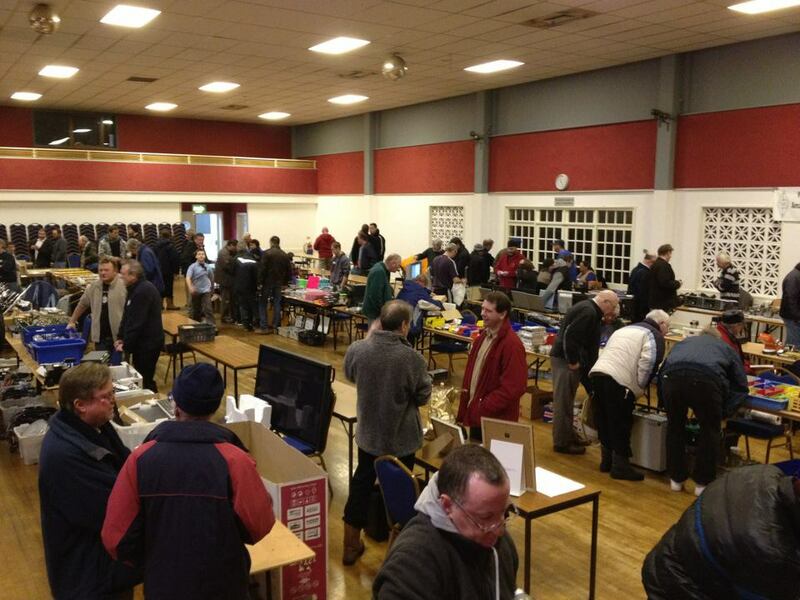 Canvey Rally was a success, with, it is thought, 200 punter – this was simply wonderful bearing in mind the dreadful conditions outside the hall. CARS Table did good Service and our thanks to all involved. Sorry, but we simply did not want to have heard of car crashes and people slipping up. The Canvey Rally photo is from Peter Sipple, M0PSX (via Trevor M5AKA), the Duck Pond is a Danbury by Trevor, the car is mine and the “Snow Man” is today from Paxos near Corfu from my Son using golf ball sized Hail Stones (which did a lot of damage). 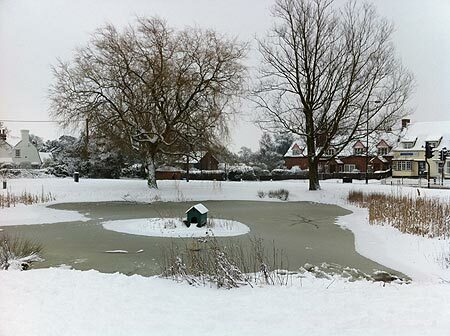 The Duck Pond at Danbury taken by Trevor, M5AKA on his way to the Canvey Rally. 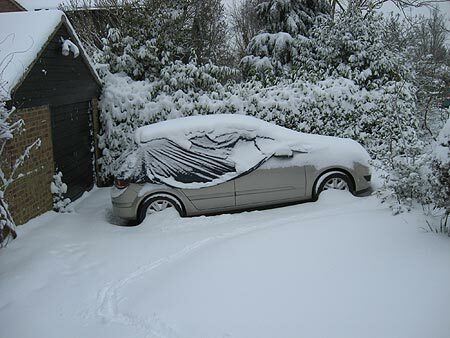 The cars belonging to G8DET well snowed in. 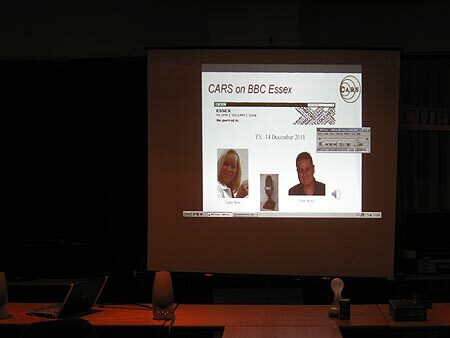 The Canvey Rally taken by Peter Sipple, M0PSX. 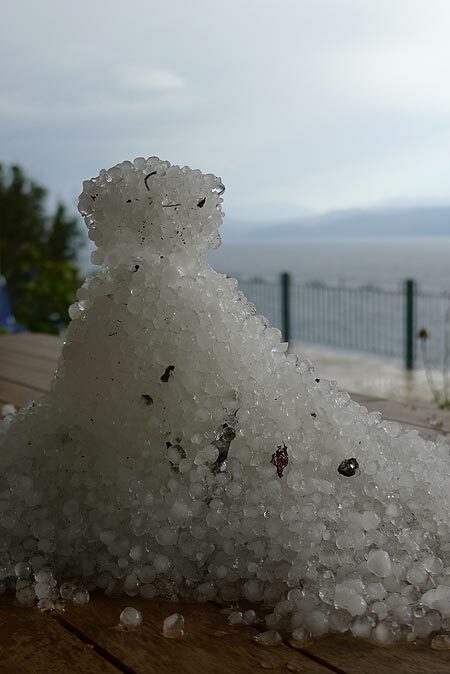 A Snow Man made out of Golf Ball sized Hail Stones on Paxos near Corfu, 5th February 2012. Photo taken by David James, M1DCJ at his QTH. Don’t forget, you only have six months left in which to construct something and enter the CARS Constructors Competition, so why not make Carl G3PEM’s day and have a go, you never know, you may just win! 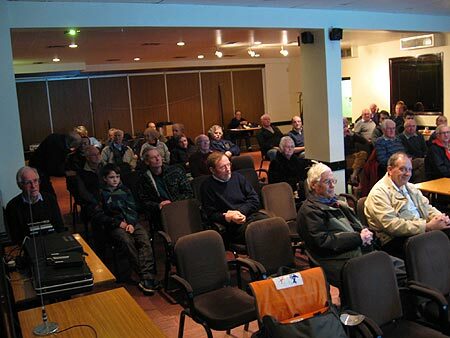 The March Meeting was on March 6th at MASC when Andy Tyler, G1GKN presented "Testing Aerials". 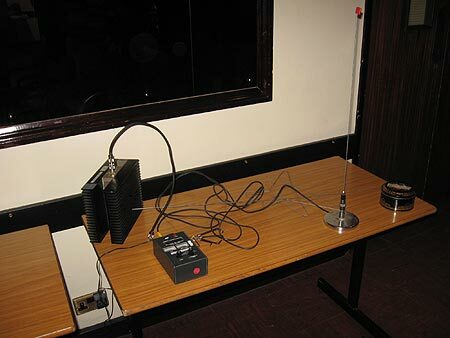 Every antenna has at some time in its life been measured to ensure that it complies to its requirement specification. For a mass produced antennas this may only happen when the antenna is first developed, for other antennas 1-in-10 or even 1-in-1000 may be measured just to ensure that the manufacturing process is good. For safety critical antennas like Air Traffic Control Radar antennas every antenna will be measured and set up to ensure optimum performance. This month's CARS talk looked at how antenna measurements are made by the professionals with their array of high-tech tools and equipment. Andy, G1GKN has been professionally measuring antennas for the last 25 years and over that time has measured many thousands of antennas from mobile phones to large radar antennas. An interesting and informative Meeting - we hope Winter has finally left Chelmsford for this year. CARS had the famous Raffle run by Peter Graves, G0KSJ. The Raffle ticket helps pay for the room (and you may even win a lovely prize).